The 2017 Rotax Pro Tour came to a thrilling conclusion in Albury-Wodonga with all eight finals coming down to the wire. The perpetual Jason Richards Memorial Cup for DD2 went the way of Series leader coming into the weekend, Joshua Fife. He was involved in a spirited battle with last year’s winner Joshua Car for the entirety of the race, ultimately though the TWM Kosmic racer from Canberra emerged on top from Car with Ryan Kennedy pulling a last corner move for third. It was awarded in Albury this year given Richards’ team in the Supercars Championship, Brad Jones Racing being based in the border city. Jac Preston became the first junior to win two rounds of the Rotax Pro Tour this year, although he didn’t have it easy. It raged with his fellow Kosmic pilot, Broc Feeney, the pair of them swapping the lead even into the last lap. Danny Wright made a welcome visit to the top step of the podium in DD2 Masters. The Praga driver has been chasing speed throughout the course of the season and it came together for him today getting a win over Troy Woolston and Troy Bretherton – who fought valiantly throughout the day. Another Rotax Pro Tour veteran in Lane Moore returned to the top step of the podium in Rotax Heavy. Kris Walton – who won every race to the final – stuck with Moore throughout the pair swapping the lead on a few occasions. Chris Farkas had to fight hard for the final podium position. Zac van Leeuwestyn put Farkas to the sword for much of the final, however Tony Kart Farkas used his experience to pull clear in the end. Hugh Barter got the best of a wild Mini Max Final. He survived a last lap divebomb from Series Champion-elect James Wharton on the last corner, that move opening up second place for Jack Childs – his first Pro Tour podium and Cody Maynes-Rutty who has been strong all weekend. Outgoing Champion, Cody Gillis won a frenetic Rotax Light final. The lead changed between Gillis and Brad Jenner. Jenner dropped out of the top three as Kosmic driver, Rhys Astley took his first Rotax Pro Tour podium crossing the line in front of FA Kart racer, Jordan Pike. 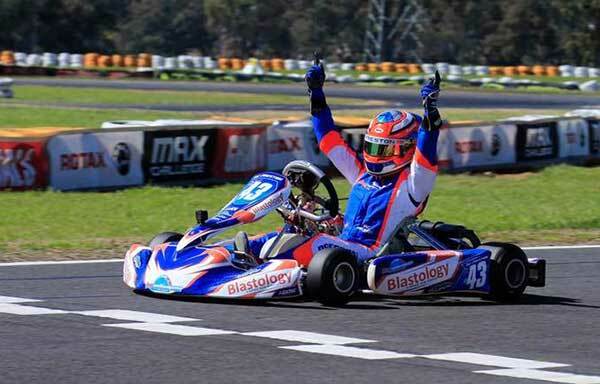 Harry Arnett confirmed his place in Micro Max for the Rotax Max Challenge Grand Finals with a dominant win. His closest rival in the race to the worlds, Jake Rutkowski didn’t get away in the final and had to watch from the sidelines. Jonathon Marcusson left it until the final corner of the final race of 2017 to take victory in Junior Max Trophy. He and Russell Mayo fought it out from the beginning to end of the 17 lapper and whilst Mayo pulled more than 0.6s with a few laps to go, Marcusson fought back to bookend his season with wins. Jacinta Hoey secured her first Rotax Pro Tour podium finishing third. Team Australia was released at a gala presentation awards night in Albury, along with the Team Australia Captain and the Jason Richards Memorial Award winner.